Moments after his conviction for a murder he did not commit, at a trial presided over by a judge determined to find him guilty, Benjamin Weaver is accosted by a stranger who cunningly slips a lockpick and a file into his hands. In an instant he understands two things: Someone had gone to a great deal of trouble to see him condemned to hang—and another equally mysterious agent is determined to see him free. So begins A Spectacle of Corruption, which heralds the return of Benjamin Weaver. 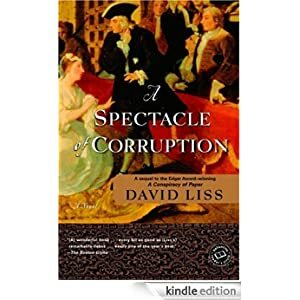 After a daring escape from eighteenth-century London’s most notorious prison, Weaver must face another challenge: how to prove himself innocent of a crime when the corrupt courts have already shown they want only to see him hang. Desperately navigating a labyrinth of politicians, crime lords, assassins, and spies, Weaver learns that, in an election year, little is what it seems and the truth comes at a staggeringly high cost. This historical thriller is selling for $1.99 today.